Did You Know An Old Tennis Racket Can Become A Work Of Art? souvenir and photographs. 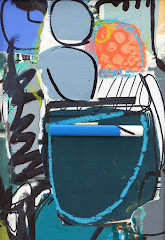 Create a three dimensional collage or mixed media project using a vintage tennis racket as a support. This clever idea was spotted at The Harwinton Antique Show You can use vintage images, old greeting cards, vintage medals, ribbons, ephemera, school pins, jewelry etc. What a terrific idea for a gift for a sports collector of for father's Day! Labels: "mixed media art", "mixed media", "retro decorator", "Retro Hang-Ups", "Retro Style Decorating"
Would a ping pong paddle work? Enjoy the colordul ride as Dianne takes you along to some of her favorite art studios, exhibits, shows, markets etc. Find Out Nifty Ways To Display Antiques And Collectibles in your shop or booth. Advice on starting and running an antique biz. Learn about caring for aging parents, downsizing, estate liquidation, moving and re-location, Assisted Living, Congregate Housing and more. 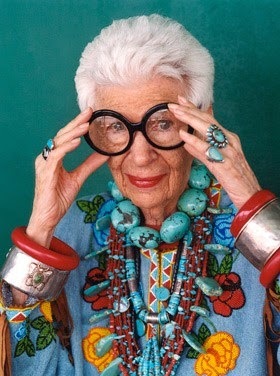 I'm addicted to Pinterest.com. Click on the image above and read more about my Pinterest boards and see great pictures of kitsch, vintage, antiques, collectibles and more. 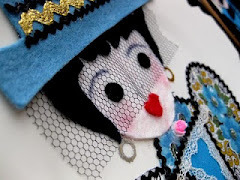 Read All About Kitschy Retro And Vintage Sewing Projects, Crafts, Art And Mixed Media. Click On The image Above. 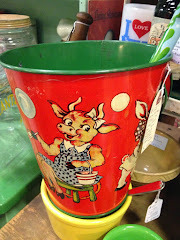 Collecting And Decorating With Vintage And Retro Baby, Kid And Doll Stuff. Just Click On The Image Above. Shrink Rap From Our Very Own Kitsch n Shrink About The Psychology of Collecting. Just Click On The Couch And Your Are In Session. 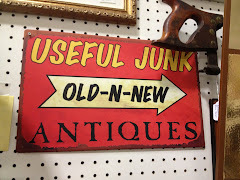 Junk R Us... Confessions And Tips About Junking From The kitschy Collector. Just Click On The Image Above. 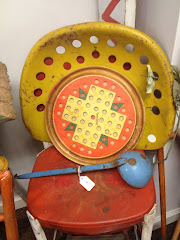 My favorite antique shops, haunts, antique malls and off the beaten path stops beyond Connecticut. Links to My Favorite Funky, Hip, Retro, Artsy Blogs and Sites "Everything But the Kitsch n' Sink"
Grab my button for your blog! Simply copy the code below.